Since 2010 Samsung has grown to become not only the clear leader in the Android smartphone space, but the largest smartphone manufacturer in the world. Its annual iteration of the Galaxy S platform is now arguably one of the most widely anticipated smartphone launches each year. Like clockwork, tonight Samsung announced the Galaxy S 4: a 5-inch 1080p smartphone, and the new flagship for the Galaxy brand. We just finished learning about the device and spent a short time playing around with it. 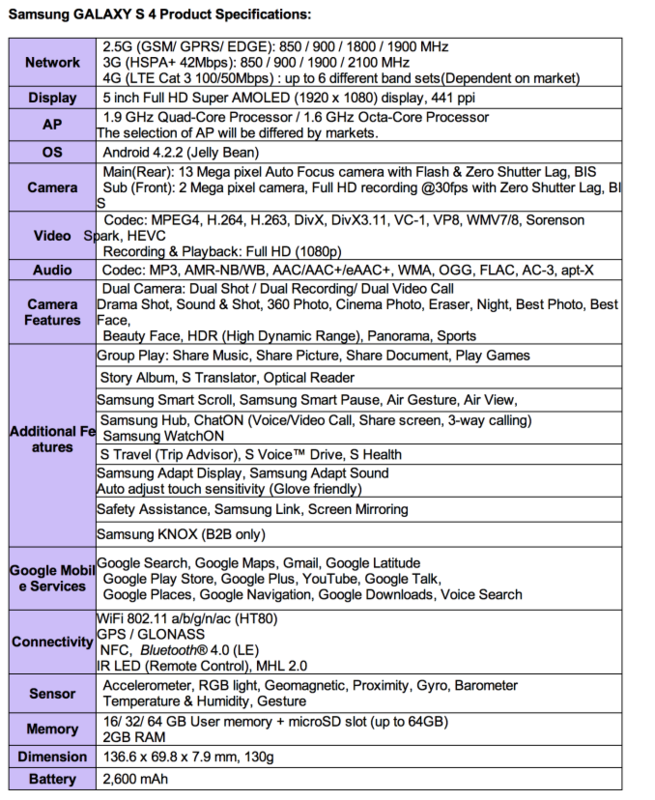 Most of the hardware specs are known quantities. The 5-inch Super AMOLED display features a 1080p resolution, for a pixel density of over 441 ppi. The chassis is plastic with a metallic looking rim around the edge. 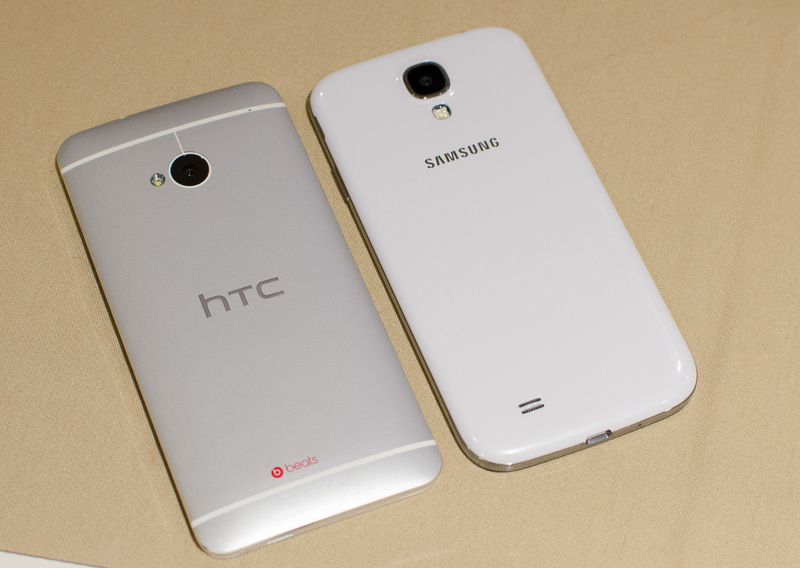 Like most Samsung devices, the Galaxy S 4 feels well built although the plastic construction makes it the polar opposite of HTC's One - and truthfully in a different league altogether. I don't personally believe Samsung's use of plastics is terrible, but it definitely doesn't lend itself to the same sort of remarkable designs we see from HTC or Apple. 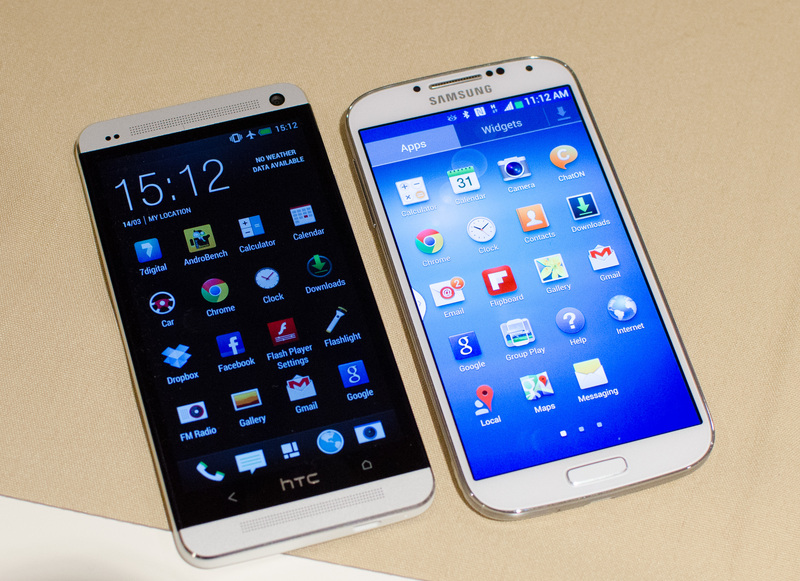 On the plus side the SGS4 feels very light (it's even lighter than the SGS3). The tradeoff between material feel and weight is one that has a spectrum of solutions. Samsung remains on prioritizing weight and cost, which is understandable given the success the company has seen thus far. 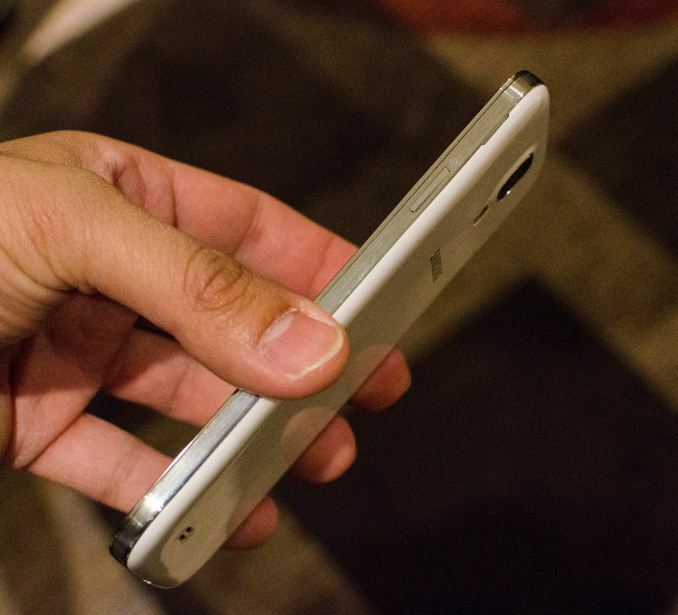 The SGS4 feels surprisingly comfortable in hand, partly due to weight and party due to the device's proportions. I didn't mind the size at all. 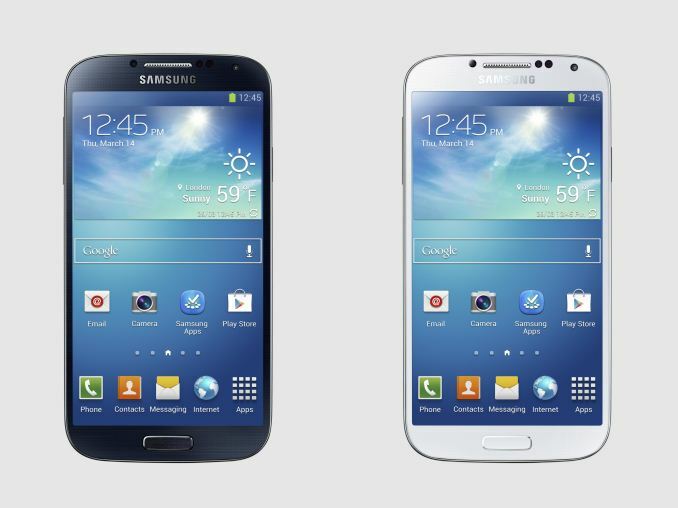 The Galaxy S 4 is available in two colors: white frost and black mist. I played with an international SGS4 variant in white frost. Internally, there’s 2GB of memory and 16 - 64GB of on-board NAND, with a microSD card slot for optional storage expansion. As expected, the SoC will vary depending on region. 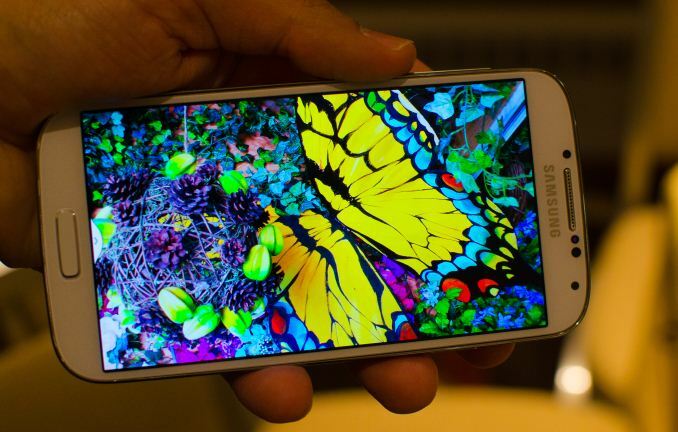 Samsung will offer either its own Exynos 5 Octa or a 1.9GHz quad-core Snapdragon SoC from Qualcomm. Given the clock speed and the timing, I would assume Samsung is talking about a Snapdragon 600 but the only official word from Samsung is the 1.9GHz quad-core Snapdragon. Update: Qualcomm has confirmed that this is a Snapdragon 600. The Exynos 5 Octa side is a bit more interesting. Samsung is calling the SoC a 1.6GHz Octa-core part, but that appears to be the clock speed for the four Cortex A7 cores. The four Cortex A15 cores will run at up to 1.2GHz, which should help keep power consumption manageable. We’ve been wondering for a while what clock speeds we’d see the Cortex A15s run at in smartphones, and I believe this is the first line drawn in the sand. If we go back to Samsung’s ISSCC disclosure of Exynos 5 Octa power consumption, it looks like peak CPU power consumption should be somewhere around 2W - definitely better than what we saw from Exynos 5 Dual in the Nexus 10. Again, no surprises here given that we’re talking about a smartphone - it’s just interesting to see. Update: There seems to be some confusion as to whether or not the A7/A15 clocks are 1.6/1.2 or 1.2/1.6. I was told the former and that's what I wrote down, but it's entirely possible that the information given wasn't correct. I'm awaiting for further confirmation. Although 1.2GHz makes sense for a max clock for the A15s, 1.6GHz is a bit high for A7s if they're truly to be used to keep power consumption down. I can see it working either way. 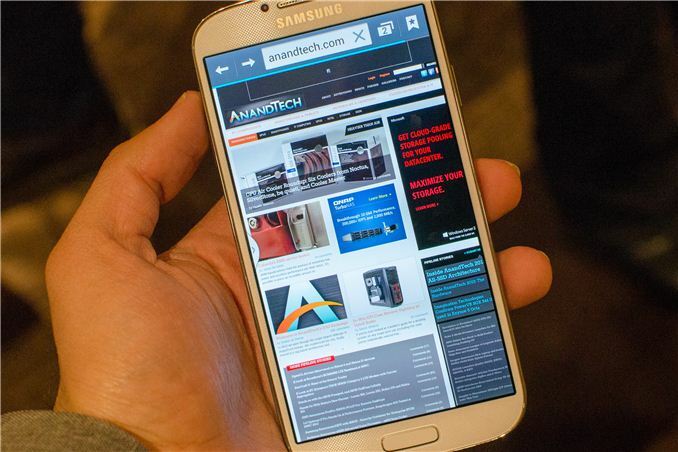 Samsung isn’t ready to talk specifics about what SoCs will end up in what regions. We weren’t allowed to run any downloaded applications or benchmarks on the hardware at the event, nor were we told what SoCs were used in the demo hardware. Both SoCs should be good choices though. Similarly, there’s no disclosure on what baseband silicon is being used although LTE support will be offered depending on the region. It’s highly likely that we’re looking at another MDM9x15 with a discrete applications processor (Snapdragon or Exynos 5 Octa). All of the expected wireless connectivity options are present including 802.11ac and BT 4.0. Samsung is claiming support global LTE roaming (up to six different bands) and FDD/TDD LTE. As is the norm these days the Galaxy S 4 comes with both a front and rear facing camera. The front facing camera features a 2MP sensor and is capable of recording video at 1080p30. The rear facing camera sees a move to a 13MP sensor with flash. No word on the max aperture or focal length of the camera systems at this point. The Galaxy S 4 will ship with Android 4.2.2. It will be available both internationally and in the US starting sometime in Q2 (Update: first shipments will be in April). US operators signed up to carry the Galaxy S 4 are AT&T, T-Mobile, Sprint, Verizon, Cricket and US Cellular. 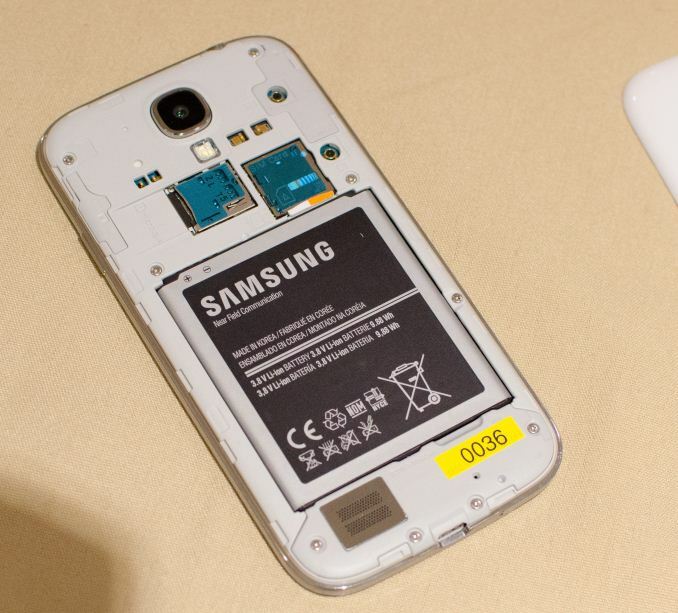 Yup, Samsung high end phones - removable battery and MicroSD slot. You get docks that can charge the phone and a spare battery simultaneously, it's much quicker and easier to simply swap over batteries rather than having the phone attached to an emergency charger for a couple of hours if you're still making calls or similar. Is it really though? If you take the battery out, your phone turns off. Meaning you may miss calls, messages, you have to take the back off, replace the battery, turn back on, wait for it to load, sign back in etc. With an emergency charger you can just plug into the bottom of the phone, you can continue to make calls (no cables) and you don't need to turn your phone off. Also, you can get different sized emergency chargers which can charge your phone up 2 or 3 times. means the phone is off for less than 30 seconds, typically, so very rarely do I miss calls or messages. . . and the whole process takes maybe 30 seconds. . .